On the first day of the 2014 Sierra Challenge we had a healthy number of participants - 24 - show up for the hike up Robinson Creek to Slide Mtn. The peak is one of a handful of summits in the state over 10,000ft in elevation with more than 900ft of prominence that I had yet to visit, providing an obscure reason to visit an obscure peak. The others didn't seem to mind much. It wasn't a very difficult day, mostly on trail with only a short portion of cross-country travel required. Among our band were a reporter and photographer from the San Jose Mercury News. They were there to write a story for the paper about the Challenge, using the first day to get quotes from other participants and photos for the newspaper and online articles that would result. As the story's writer, Joe had spent several hours with me at home a week earlier to get background info. He was 60yrs+ and though in decent shape, didn't expect he'd make it to the summit. He was more confident that his 54yr-old photographer would fare better in making it to Slide Mtn, but I don't think he really had a good idea how fast this group moves both on and off trail. It was 6a when we started from the Twin Lakes parking lot, but it wasn't until 15min later that we took the obligatory starting photo when we reached the TH at the far west end of the campground. It was a pleasant enough hike up the Robinson Creek Trail, long and flat at first, eventually climbing up to Barney Lake which we reached in the first hour. Last year's summit, Crown Point, can be seen majestically rising in the background from the lake's outlet. Most of another hour was spent reaching the junction with the Rock Island Pass Trail. Our route became more scenic as we passed by Robinson Lakes, Crown Lakes and a few smaller, unnamed ones. Crown Point is close by on our right as we passed through this lovely alpine lake setting. Ahead we can see a headwall that looks like it ought to be Slide Mtn, but our summit is out of sight a short distance behind it (the headwall is a feature Secor records as the Juggernaught). By the time we reached the Mule Pass/Rock Island Pass trail junction at 8:50a, our large group had dwindled. Jonathan, Bill and Eric were still hiking with me while two others, Nick and Greg, were ahead somewhere towards Mule Pass. The rest were at various stages somewhere behind. We reached the unnamed tarn about a quarter mile west of Mule Pass and paused to get water and consider our cross-country options. There were two chutes available along with what looked like class 3+ options on the rock up the middle. We spied Greg in his red shirt scrambling up the rocks about the halfway point - he was going to beat us all to the top today. Eric and I decided on the left chute while the others took the right one (which turned out to be the shorter route). There was a small amount of hard snow in both chutes, but it was easy enough to bypass on the side. At the top of our chute by 9:30a, we were treated to a nice view looking southeast into Slide Canyon and Northern Yosemite. To our right we found an unexpected additional 300ft of scrambling to the summit, or more correctly, one of the summits. Seems the topo map has the east summit as the named point but looking west there was another nearby summit that looked higher. Greg was already at the western point when Eric and I reached the east summit. Finding no register at the eastern point, we made the five minute excursion to the west summit. The GPS showed it to be about 12-15ft higher than the east summit. We found no register at the higher point either, but Jonathan had come prepared with a brand-new one to leave. We spotted others now arriving at the east summit and waved them over. To help convince them, we raised up the new register which they were led to believe had been found here. Over the next half hour we had 13 folks reach the summit. Greg had left before the rest of us arrived and Eric would leave before getting a group photo, but it was a pretty good number for such a remote peak. It had taken anywhere from 3 1/2 to 4 1/4hrs to reach the summit. The views were striking on a remarkably clear day, especially considering that smoke had been obscuring much of the range over the past several weeks. Looking south, the most striking feature was Suicide Ridge just over a mile distance. To the west rose Tower Peak in the distance with many of the granite domes that characterizes much of Northern Yosemite. To the north we could Little Slide Canyon, the Incredible Hulk and flat-topped Eocene Peak on the west end of Sawtooth Ridge. To the east played out the full extent of the Sawtooth Ridge culminating in Matterhorn Peak and Whorl Mtn. Jonathan passed around chocolates and the register while most of us were staying out of the chilly wind in the sandy nooks on the north side of the summit rocks. It was a nice place to lounge about while waiting for others to arrive. After taking our group photo we began to head back down. I went first to look at the route to Suicide Ridge, waffling on whether to go after a bonus peak or simply head back. I took a hard look at it and Bath Mtn, further south, before retreating - not today. (Bill Peters would go to both of these summits in the course of a very long day, showing a good deal more stamina than I was willing to exert.) I descended the shorter, wider chute that Eric and I had forgone earlier. I found Michael and a few others also descending, along with Matt Yaussi just making his way up to the summit. There was some talus and boulders to negotiate before reaching the tarn and the trail where we had left it previously. Some minutes after starting back down on the trail we came across the Mercury News team near the Mule/Rock Island Pass trail junction. We paused here to give them a chance to get some quotes and take a few photos, obliging them further with a video shoot on the switchbacks descending to Crown Lake. It took all of about ten or fifteen minutes, then we were off as the two waited for others to make their way back from Slide Mtn. A group of four of us were hiking down the trail past Crown Lake as Jonathan began to orate once more on the edible mushrooms of the Sierra Nevada. I had heard most all of this the previous year, but he had a most interested listener in Michael who was himself a mushroom collector and something of an expert. Needing a bit more peace with my Wilderness, I found a shortcut around one of the windy portions of the trail and was soon jogging ahead of the others out of sight and undetected, at least at first. 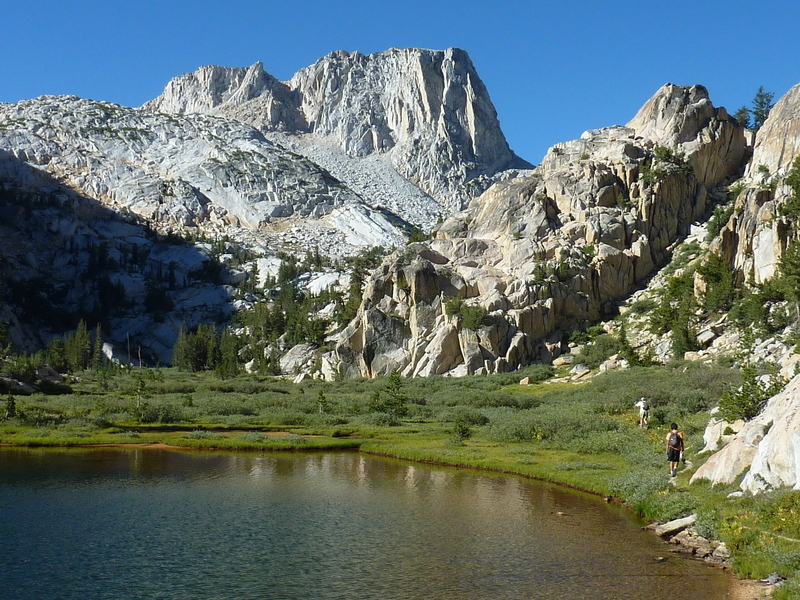 I jogged on and off over the next several hours, making my way past the ever-popular Barney Lake, past the famous flat rock marking the junction with the Little Slide Canyon use trail, and back to the campground at Twin Lakes. Despite my hustle, I was only ten minutes ahead of Jonathan, Michael and Nick who were pretty close on my heels. The outing had come in at under 8hrs, which is usually good enough to allow plenty of rest for the next day. Today would have other complications, however. Still, we managed to get some 20 folks to the summit of Slide Mtn and back again safely. Back at my van, I was met my a gentleman who introduced himself as Dave, owner/manager of the resort. I thought he was there to discuss his displeasure with my rather large group occupying all his day use parking slots, but it was for an entirely different matter. One of our participants had gotten in an accident, his partner returning a few hours earlier to call SAR. This was the thing I dreaded most - another serious injury. I found Toshi at the entrance gate waiting by the phone as instructed by the SAR team. Toshi filled me in on what had taken place. He and his cousin Kentaro had been attempting to climb the Dragtooth from Polomonium Pass. They found hard snow conditions which proved too difficult for the axe and microspikes they were equipped with. Kentaro had slipped on the steep slope, falling some 150ft and tumbling head over heels before coming to rest in the talus below. He had serious lacerations on both arms and was unable to use them in descending the boulder field they had ascended earlier. At Kentaro's request, Toshi put tournequets on both arms to stem the bleeding, left his water, food and clothing with Kentaro and then descended to Twin Lakes to call SAR around 1p, about an hour before I first spoke with Toshi. The tournequets had me worried when he mentioned them as I knew from first aid training that they are no longer used except in very serious situations - limbs can be lost if blood circulation is cut off for several hours. After some waiting, a helicopter was dispatched from Yosemite NP to fly to Sawtooth Ridge and look for Kentaro. We watched it make many passes from below, seeing it veer off to search other areas before going back to the pass to look again. It seemed they either could not spot Kentaro or could not find a place to land. Eventually it flew off to Mammoth Lakes to refuel and by phone SAR asked Toshi to go to the Bridgeport airport to provide them more detailed information. I joined Toshi and the SAR team that had assembled there around 5p and spent more than an hour there, feeling mostly helpless. Toshi had provided them with photographs taken earlier in the day and very precise info on where Kentaro had been left. I met the SAR lead, Barry (bearnz from SummitPost), who I had known for years online but never met. We both wished it had been in better circumstances that we'd had the opportunity for our first meeting. The helicopter made a second search for Kentaro after refueling, but again he wasn't spotted and the helicopter then joined us in Bridgeport. Two of Barry's SAR team members were equipped and quickly packed up to be inserted up in the mountains to search for and hopefully find and treat Kentaro. They were equipped with gear for an expected overnight stay. After being dropped off, they did not take long to find Kentaro. As surmised, he had tried to descend after being up there alone for many hours, but he did not get too far, his injuries getting the best of him. The helicopter returned around 7:20p to extract Kentaro and the SAR team. Kentaro was taken to Modesto where he was treated for broken ribs, a punctured lung, lacerations on the arms (luckily the tournequets did no serious harm) and various smaller injuries. He was expected to make a full recovery. Toshi drove that same night to Modesto to join his cousin. Once again, the SAR team did an exemplary job - I am indebted to them for their selfless dedication to helping fellow hikers and climbers. A huge thanks to Barry and his team along with the Yosemite personnel who were involved in this rescue. Great write up in the San Jose Mercury News! It was sad to read about the accident, but I am looking forward to the rest of the this years reports. That guy that dropped back to join Bob's chase group at the tarn after Greg's pace became a bit too much looks more Chewbacca proportioned than Nick. Tower Peak from Mono Village next summer with or without y'all!